On the eve of the Civil War, each region of the state of Maryland had formed its own distinctive character. Each area’s stance on the questions of slavery and secession depended on interconnected factors such as its demographics, landscape, and connections to trade. Farmers on the marshy Eastern Shore and in the tidewater region of Southern Maryland, once dominated by the tobacco crop, largely favored maintaining their right to own slaves as their livelihood relied upon it. Baltimore, home to a large free black population and trade magnates who profited handsomely from business with the South, housed both strongly pro-Union and pro-Confederate residents. The hilly countryside west of Baltimore, dotted by small family farms with a heavy German influence, leaned more towards the Union—though this region also produced Confederate leaders such as Captain Bradley Tyler Johnson. In April 1861 Maryland saw the first land battle of the Civil War, when a mob in Baltimore attacked the 6th Massachusetts Infantry Regiment as they marched through town, crossing from one train station to another. In the aftermath of the Pratt Street Riot, Governor Thomas Holliday Hicks—himself a slaveholder—felt great pressure from Lincoln to keep Maryland part of the Union, at any cost. Hicks’ solution to the delicate question of secession was to convene a special session of the General Assembly in Frederick, a largely Unionist stronghold, rather than in the pro-Southern hotbed of Annapolis, the state’s capital. Meanwhile, Lincoln’s administration declared martial law, suspended the writ of habeas corpus and began arresting anyone suspected of harboring Southern sympathies, including many elected officials. The General Assembly met in Frederick’s Kemp Hall throughout the summer but ultimately could not vote upon the question of secession because a quorum could not be met. Ultimately, Marylanders had little choice but to remain in the Union—though sectional tensions simmered across the state throughout and after the Civil War. Although Maryland was not the only state that was home to both outspoken Unionists and secessionists, the Old Line state represented a microcosm of the Civil War as whole. Lincoln’s famous adage of ‘a house divided’ could be found quite literally here. Like the fictional Foster family, within the actual Shriver family, two brothers found themselves on opposing sides of the sectional conflict. Andrew Shriver, a slaveowner, pledged allegiance to the Union while his brother William, who did not own any slaves, sided with the Confederacy. Their family homestead, Union Mills, hosted both federal and CSA troops en route to Gettysburg within one 24-hour period. Andrew’s son Henry served in a militia of Pennsylvania volunteers and four of William’s sons fought with the Confederacy. In this case, the analogy of brothers fighting brothers was not much of an exaggeration. 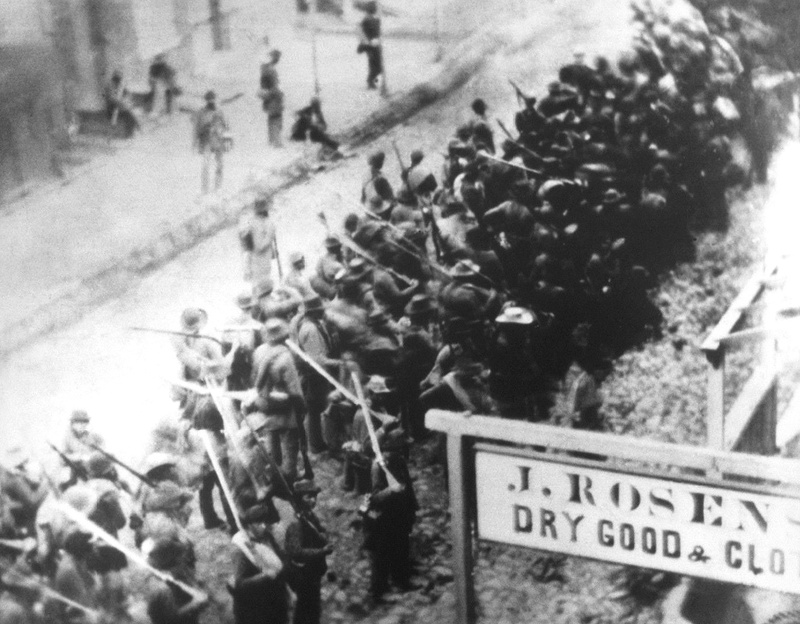 Troops marching through Frederick, Maryland. This is the only known photo of Confederate troops on the march. Maryland’s location south of the Mason-Dixon line and its proximity to the nation’s capitol made it a lynchpin to the Union during the Civil War. Unlike other states that sent troops but didn’t experience the devastation of war firsthand, the Civil War left a permanent mark upon the civilians of Maryland—regardless of their political inclinations. This border state experienced three major waves of troop movements during the Civil War: the Maryland (Antietam) campaign in the fall of 1862, the Gettysburg campaign in July of 1863, and the Battle of Monocacy (also known as “The Battle that Saved Washington”) in July 1864. After each of these engagements, communities opened their homes, churches and schools to wounded soldiers as makeshift hospitals. The damage wrought by war left some family farms unsalvageable. For example, Daniel Wise—who operated a small farmstead at Fox’s Gap on South Mountain—returned to his cabin after the September 1862 battle to find the bodies of 58 Confederate soldiers in his well. The Wise family was forced to leave their land and livelihood behind as a result of the Civil War appearing at their doorstep. Auni Gelles has been with the Heritage Area since August 2014 and has served as Assistant Director since November 2015. Prior to becoming involved with Maryland’s Heritage Areas program, she spent time in the New Media department at the National Museum of American History and working on history and literature programs at the Maryland Humanities Council. She received a B.A. in anthropology and sociology from Goucher College and an M.A. in Historical Studies (public history concentration) from the University of Maryland, Baltimore County. A Baltimore City resident, she enjoys traveling to historic sites across Maryland both on the job and off.